Record heat in 2015 is melting glaciers at an eye-popping pace. A lake at the end of the Columbia glacier, in the North Cascades range of Washington state, is growing as the glacier melts. Click image to enlarge. With nearly a month left in the summer melt season, researchers already know that 2015, on track to be the hottest year ever measured, will be awful for the world’s glaciers, which are likely to lose more ice than any year on record. The latest evidence comes from the North Cascades in Washington state, where a team of scientists recently completed its 32nd annual survey of the mountain range’s major glaciers. The North Cascades, home to more mountain ice than any state except Alaska, is expected to lose a record amount of its glacier mass this year: between five and seven percent, according to Mauri Pelto, professor of environmental science at Nichols College and director of the North Cascades Glacier Climate Project. Smoke from the dozens of wildfires burning in Washington obscured the sky during the team’s three weeks of field work in the alpine basins between Snoqualmie Pass, east of Seattle, and the Canadian border. The catalysts for the fires — the severe heat and deep drought that wracked the Pacific Northwest this year — are also walloping the region’s glaciers. Glaciers throughout the world are in decline, and the rate of ice loss is accelerating, according to an annual report published in the Bulletin of the American Meteorological Society. Last year was the 27th consecutive year with a net decline. The rate at which glaciers are melting is nearly four times quicker in the 2000s compared to the 1980s, according to the World Glacier Monitoring Service, which has tracked 37 glaciers for more than three decades. 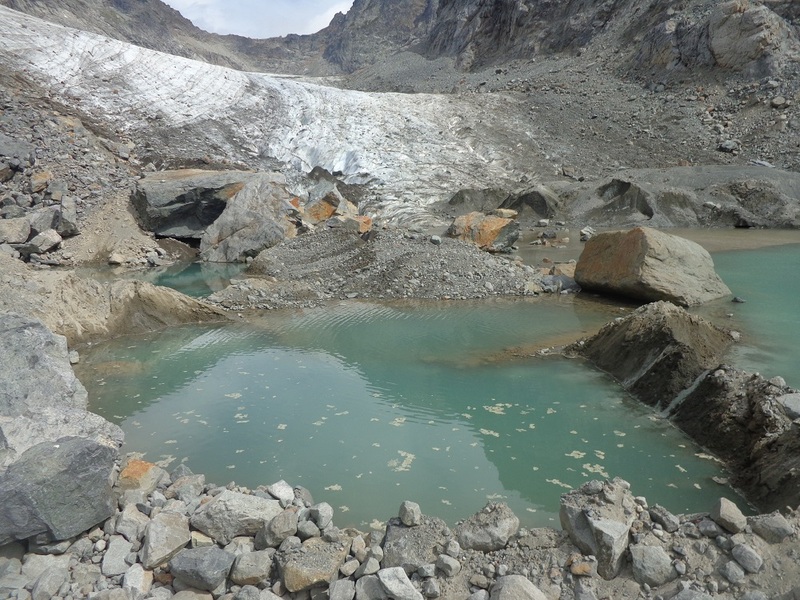 Mauri Pelto, who is the U.S. representative to the World Glacier Monitoring Service, said that with warm temperatures cooking the Alps, another current hot spot, 2015 will be the worst year on record for glacial melting. In some regions, particularly the Himalayas and Andes, rapid melting can cause lakes at a glacier’s toe to burst their banks, triggering catastrophic flooding for downstream communities. The presence of glacial lakes contributed to June 2013 floods in Uttarakhand, India, that killed as many as 30,000 people, buried highways, destroyed villages, and damaged at least 10 big hydropower projects. Though an outlier in terms of severity, the 2015 melt follows the long-term trend line, which points downward. Less glacial runoff and less snowpack will eventually lead to a reordering of the mountain ecosystem. Pika, a cousin of the rabbit, are being driven toward extinction by the loss of snowy habitat. Salmon and other aquatic species will struggle in warm, depleted creeks without the pulse of summer meltwater. Systems engineered by humans will also be altered. Hydropower production, a source of roughly 75 percent of Washington’s electricity generation, will decline. Drinking water reservoirs will require new operating procedures that reflect changes in the timing of water flows. Most of the consequences are disruptive. However, the big melt is producing an ironic benefit this year. The Pacific Northwest winter was so warm that very little snow fell in the Cascades. The freezing level — the elevation at which air temperatures were cold enough for snow — climbed up the mountains, some 1,000 meters (3,280 feet) higher than normal in February. Without the slow release of water from melting snow, most Washington streams are running at historic lows and at temperatures warm enough to kill salmon. Streams fed by glaciers, on the other hand, are getting a boost. The USA has too much ignorance in science with too many climate change deniers. These people will keep denying human impact on our climate even when the news arrive that there is no more ice to be found on the north and south pole. In America, these people are often the same kind of people who believe that it doesn’t matter because they have a personal relationship with some Jesus who is soon coming back to save them. Ten or fifteen years ago, I was watching a Senate hearing on C-Span. Senator John McCain chaired a hearing on Global Climate Change and the witnesses were from NASA and NOAH. After testimony from the scientists, Sen. McCain stated he agreed with them that human activity was causing the Earth to warm faster than Mother Nature alone had ever caused to occur in Earth’s history. The argument over “are humans responsible for speeding up a natural cycle of global warming that historically took 1,000 years to occur to only 100 years” was settled long ago. However, as we all know, the debate continues with companies that will be hardest hit (coal companies, power companies burning coal, steel industry, etc.) arguing the science is not conclusive. However, most knowledgeable people realize the truth. I am sure many people argued the world was flat for centuries after proof showed it was not. The trouble is we do not have centuries to wait before acting on the current problem! Unlike Peter Mortensen, I hope there is a God in Heaven. Simply because we will need his help on this problem that humans caused (again). God Bless not only the U.S.A. but Earth!